Friday night, at the Hisham Hotel, Amman. 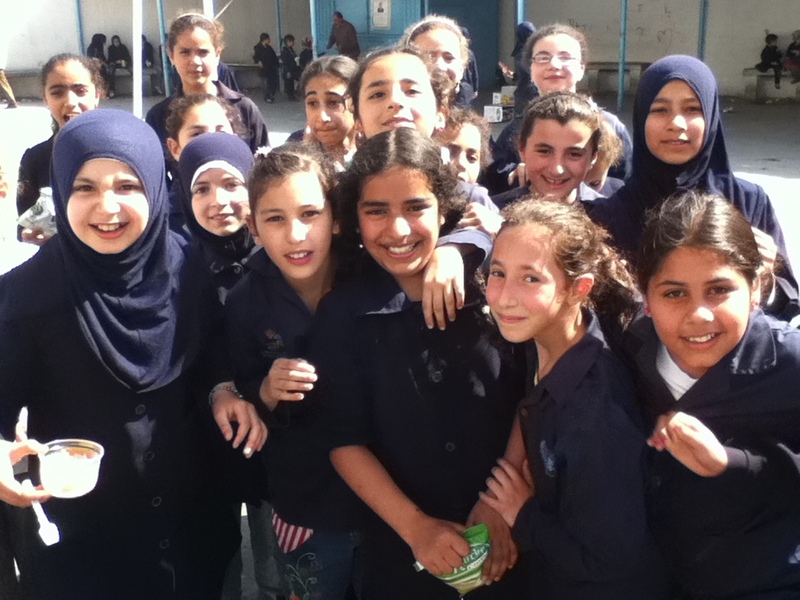 Yesterday I was in Tripoli visiting an girls’ elementary school in a Palestine refugee camp. I was there with a couple of UNRWA staff (UNRWA is the UN agency for Palestine refugees). The point of the visit, along with other visits throughout Jordan and Lebanon this week, was to get a sense of the way in which human rights was being integrated as part of the curriculum. My job this week has been to essentially listen to people tell me their ideas and opinions. Say “human rights” and, depending on where you say it and who you say it to, you will get reactions ranging from ignorance, acceptance, indifference, outrage, and anything else in between. In other words, it’s hard to predict. Before going to the school in the camp, I had the chance to listen to members of different “Popular Committees” from the camps – basically the elders (all male). The reactions from some of them were quite strong: they wanted the full realization of their rights as refugees – and NOW. There wasn’t much I could do other than listen and tell them I’d taken note of what they said, and appreciated their honesty. Human rights – at least the way I see it concerning children’s education, is not so much as telling them what rights they do have/could have/don’t have, but creating an environment in which students (and teachers) respect each other and live and learn in dignity. If that’s a culture that ends up spreading more towards the students’ families and the broader community, all the better. It’s not to say that there are certain human rights issues teachers should avoid teaching (after all, they are refugees and some topics will inevitably arise). But, as a friend in Beirut told me earlier this week: it’s not a question of choosing the issues, rather it’s finding the right way to teach each issue. He was making particular reference to teaching about the death penalty, but it’s an argument that extends to all rights. They warmed up to me eventually. Visiting the girls’ school was a further validation of the importance of education. Three students from the school parliament sat in the Head teacher’s office with us to talk about the activities they’ve done to create a healthy school environment. The parliament’s role extends beyond a clean school: it also serves as a platform for students to express their opinions, questions, and grievances to the school management. From what the girls were saying, it works. Although one shyly admitted that she asked to realize her rights by asking the teachers to take the students up to the mountains but was refused. (Well, Article 12 of the Convention on the Rights of the Child does say a child has a right to be heard. Whether or not someone’s listening on the other end is another matter. But then again, I’m wondering what the connection is between a trip to the top of the mountains and human rights…). The school’s efforts in promoting human rights are laudable given the resources available. But there is a lot more that could be done, which is the main reason why UNRWA is supporting the integration of human rights in its schools. Visiting the school was an acute reminder of my first experience in international development 18 years ago in Malawi, teaching at a girls’ school. The similarities between the school in Tripoli and the one in Malawi are numerous. The conditions in which the girls live (excluding the school) are deplorable, but despite that they strive to live a life of dignity and continue to do what children love most: to play and have fun. They are children after all.